We sincerely hope you'll enjoy your tour - an historic overview of the area. This stunning example of the Spanish Colonial Revival style with its thick stucco walls, wood grille windows, red tile roof, and Moorish arches is on the National Register of Historic Places. It stands along the railroad tracks where Claremont began in 1887 as a townsite on the Santa Fe Railroad route into California. This 1927 structure replaced the original 1887 wooden Victorian station. In 1967, the Santa Fe closed the Depot and it remained vacant until 1990, when the City of Claremont purchased the building and restored it to its 1920's splendor to serve as a transit center for Metrolink commuter trains and a regional bus system. Be sure to notice the frescoed ceiling. In 2016, the depot becomes new home of Claremont Museum of Art. 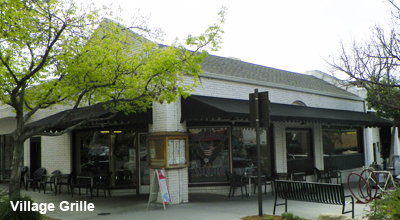 Second stop, look behind you from the front of the Depot and find Harvard Avenue - Curtis Real Estate (the longest-established real estate business in Claremont) is on the left and Tutti Mangia is on the right. Walk by Tutti Mangia 1 block north to your next stop. Administration project during the Great Depression of the 1930s. Its well-balanced facade and elevated placement help define this corner as part of the city’s civic center. Claremont artist Milford Zornes painted the mural in the lobby depicting Claremont scenes of the 1930's. Next stop is located caddy-corner from where you're standing. Continue traveling north on Harvard Avenue past City Hall until you see a two-story brick building at the corner of Harvard and Bonita Avenues. This brick building filled with eclectic group of shops, a salon and restaurant is one of the most successful adaptive reuses in the Village. The tall two-story brick structure once housed Claremont’s only movie theatre. At that time, shops were on the southwest corner: Imaginative use of the large theatre space finds shops and a salon on the then newly-created mezzanine and a restaurant with indoor and outdoor dining on the first-floor patio area. If you look across the street to the east at a single-story brick building, you'll see your next stop. Cross Harvard Avenue and continue walking east on Bonita Avenue. This unique brick building was built to house Claremont Book and Drug by Edwin and Mabel Getzman. The south part at 248 Harvard Avenue was the drug store. 250 Harvard Avenue was a book-stationery store used by Pomona College. Rio de Ojas, a unique gift shop, is its current occupant. Your next 3 stops are associated with The Claremont Colleges. Walk 1 block east on Bonita Avenue. Look to your left to view Seaver House (N/W corner of Bonita and College Avenues). If you're standing in front of Seaver House (on College Ave.), walk 1 block south (that's to your left) to the corner of Second Street and College Avenue. 146 N. College Avenue - Originally 211 N. College Ave. This large, two-story, late Victorian features a two-story turret and geometric multi-light windows. A large bay window on the south side is supported by brackets. The wraparound entry porch has classical columns. 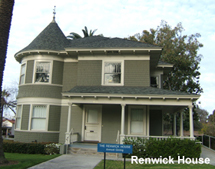 The house, which now accommodates Pomona Colleges Annual Giving Office, was built by Mrs. Helen Renwick, a widow from Iowa, who moved here to raise her only son and educate him from elementary school through Pomona College. 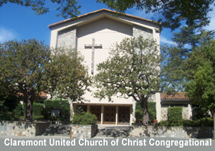 She donated the money for construction of Rembrandt Hall, the art building at Pomona College, and the establishment of Pilgrim Place, a retirement community for Christian workers. She also donated the original land behind her house to be used as the site for a Claremont library, a second version of which stands there today. Next stop, continue walking 1 block south on College Avenue to the N/W corner of First Street. This is Claremont¹s only full-scale, classic Queen Anne Victorian house. Built in 1887, it is marked by three gables, bays, sun rooms, excellent wood ornamentation in fish scale and diamond shingle patterns, and horizontal and vertical clapboard siding. The home of one of the founders of Pomona College, Rev. Charles Burt Sumner; it was moved to this site a decade after the college decided to settle in Claremont. Beautifully restored by Pomona College, it now serves as a guest house for visitors to the campus, which begins just across the street. Yes, the colors are very close to the original. Our brief look at college-oriented buildings is over. Turn right (go west) on First Street and continue 2 blocks to Yale Avenue. Cross the street, turn right on Yale Avenue, go past Espiau's Restaurante Y Cantina and you'll arrive at your next stop. Continue north to the first intersection, turn right and cross the street (go east) on Second Street. Simply look behind you (north on Yale Avenue), cross the street and you'll arrive at your next stop. To reach your next destination, cross the intersection at Second Street and turn right (north), go 1 block and you'll be there. Next, go past Rhino Records and turn left (west) at Bonita Avenue, travel 1 block ahead and you're there. Your final Village business site is about 4 blocks away. Go left (south) at Indian Hill Blvd. 2 blocks to First Street. At the intersection, go right (west) on First Street for 2 blocks. Cross (go left -south) at the intersection of Oberlin Avenue, then, right (west) in front of the Public Parking structure and you'll see The Packing House ahead. Packing House - This imposing building is the only one that remains of four packing houses that once lined the Santa Fe tracks in Claremont. It was here that the citrus fruit, which was the economic lifeline of this community, was washed, graded, stored, and shipped all over the United States and Europe, and eventually Japan. This particular concrete, block, and wooden structure was the lemon packing house for the College Heights Orange and Lemon Association. Claremont growers were among the first to organize a cooperative method for marketing their fruit. Their system, which was adopted statewide, became known throughout the world as “Sunkist.” Packing House was renovated and re-opened to include live-work lofts, restaurants, retail shops, galleries and classes. North on Indian Hill Blvd., east on Harrison Avenue 2 blocks to Harvard Avenue - N/W corner. Return to Indian Hill Blvd., continue west on Harrison Avenue 2 blocks to Avery Avenue. Turn right on Avery Ave.
We hope you've enjoyed your tour and invite you to return to the Claremont Village in the near future.